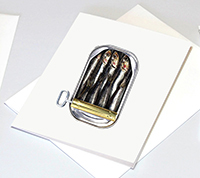 Start by downloading a template for your greeting cards below. We have templates for 5.5 x 8.5″ (folds to 4.25×5.5 and fits in an A2 envelope) or 6 x 9″ (folds to 4.5×6 and fits in an A6 envelope). Make sure you download the correct version for the size of card you want. Our templates are backwards compatible to version CS4 or later. When laying out business cards, allow at least 3/16″ margins around the edge of the card. Placing type too close to the edge will make a business card look crowded and difficult to read. Images however can go to the edges and should be extended 1/8″ past the edges of the card. This is a necessary bleed area that will be cut off in the final piece. Postcards are similar to business cards in layout guidelines, but with larger margins, usually at least 1/4″ or more, depending on the content. Bleeds should be extended 1/8″ past the edges of the card. Below are templates for the most common postcard sizes. 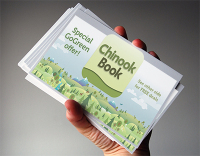 One of the most common brochure formats is the trifold, most commonly 8.5×11″ folded into thirds. In this case the finished piece is usually 3.66″ wide by 8.5″ tall. The margins should be something like .25″ and the gutters between the panels always twice the margins; in this example that would be .5″ gutters, which when folded in the middle give .25″ margins all the way around. 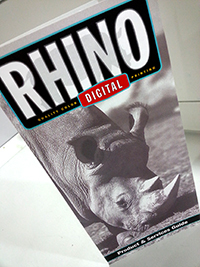 If you have a question about your order, or anything else please feel free to email us at info@rhinodigital.com or give us a call at 503-233-2477. We are open 8am – 5pm Pacific Time, Monday – Friday.